Disney’s Aulani Vacation Club Villas are the way to have fun! 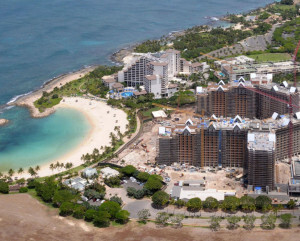 Disney’s Aulani Vacation Club Villas are the perfect way to combine the kind of fun Disney is famous for with the relaxing background that can only come from being in Oahu, Hawaii. These Disney Villas were built on Oahu to add to its resort. If you are considering buying, renting or selling a timeshare at this resort you should know or already do know that these beautiful villas will provide you with relaxing, luxurious accommodations while on your Hawaiin vacation. This resort was created jointly by architects local to the area and Walt Disney Imagineers. As a beach resort, this beautiful vacation spot boasts beautiful villas that anyone would be happy to stay in. This resort also includes a breathtaking cove and a crystal clear blue lagoon. Close to this resort is a saltwater snorkel lagoon that promises lots of family fun. There is also a pool for the whole family that features body slides and a water tube. This resort also boasts a Disney Kid’s club that hosts family-friendly activities and plans custom activities also. Children will also have a blast at Aunty’s Beach House, which is another aspect of Disney’s Kid Club. Activities offered include Hawaiian games and video games, arts & crafts, Disney movies and programs about nature and wildlife. The amazing amenities offered and fun activities offered include the Menehune Bridge, the Waikolohe Pool, the Waikolohe Stream and the Rainbow Reef. The Menehue Bridge is an interactive area where children can play in the water. The bridge has slides and a play structure as well as water elements that are interactive. The Waikolohe Pool is 8,200 square-feet and has two body slides that allow guests to plunge into the water. For those who would rather relax beside the pool than frolic in it, poolside cabanas are available. The Waikohole Stream is made up of a long tube that takes guests along the stream’s bank and offers stunning views of lava rocks. Rainbow Reef is where guests can go to swim with the animals that call the salt water of the rainbow reef their home. They can also participate in snorkeling and can even rent the necessary equipment right there. The proceeds earned go to organizations that work to conserve wildlife. Those looking for a relaxing spa will have come to the right place. This spa retreat stretches 18,000 square feet. The people of Hawaii believe in massage as a healing tradition dating back to ancient times. Guests can treat themselves to a variety of spa treatments. Anyone that wants to keep up their exercise routine need only to look to the resort’s health club and fitness center. This 2,000 square-foot attraction has both steam rooms and saunas as well as Tai Chi and Yoga classes. Disney’s Aulani Vacation Club Villas are the perfect investment for anyone looking for a timeshare they can get their money’s worth out of. This family friendly resort is the perfect place for both parents and kids to relax.